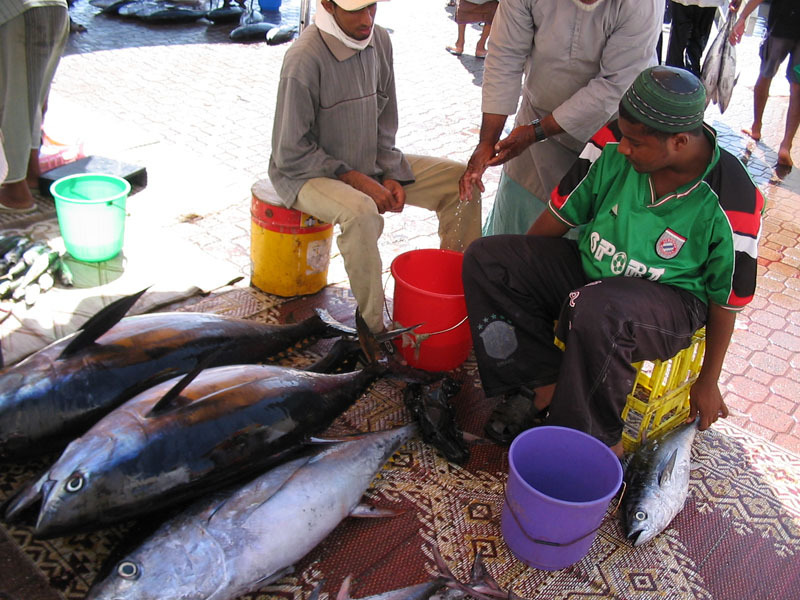 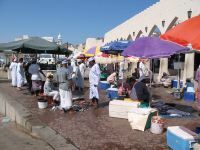 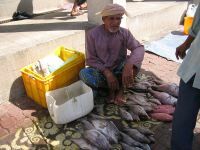 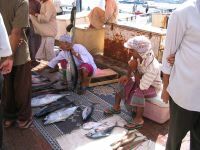 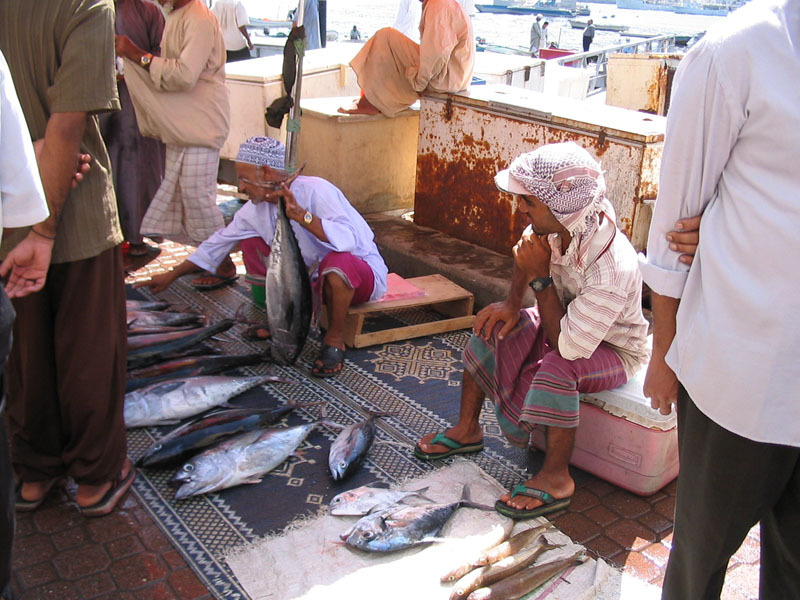 I spent three days in Oman, staying along the harbor of Muscat's Muttrah neighborhood. 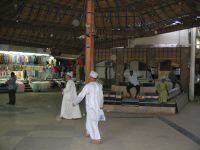 It's a friendly, relaxed place with just enough museums and markets to keep you busy for a few days. 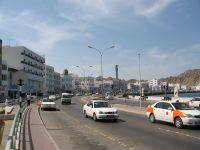 View of Old Muscat and the harbor. 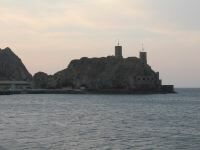 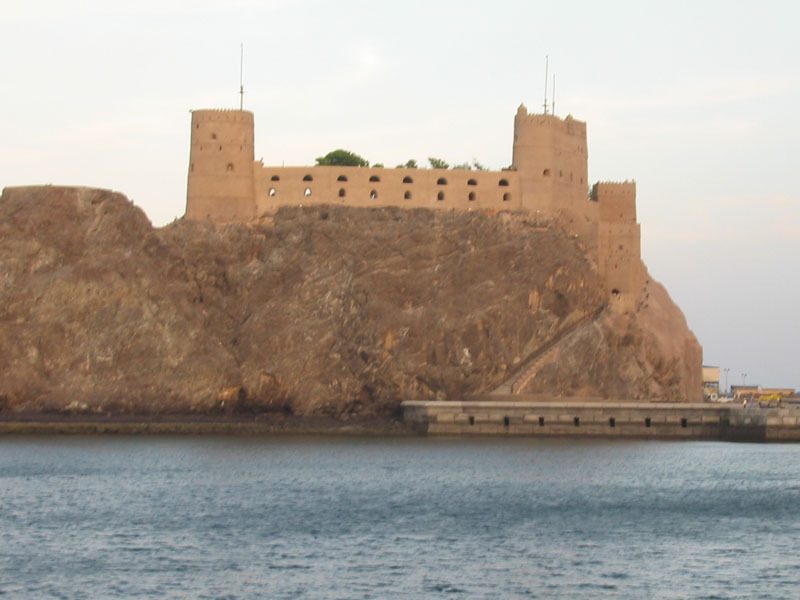 One of several forts guarding the entrance to Muscat harbor. 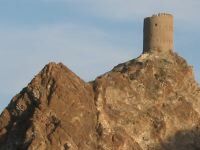 Most forts in Oman are of Omani design, but this one was built by the Portuguese. Another fort along Muscat harbor. 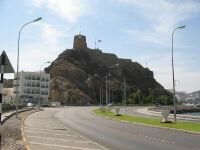 Muscat's neighborhoods are separated by dramatic, rocky hillsides, many of which are dotted with abandoned guardposts. 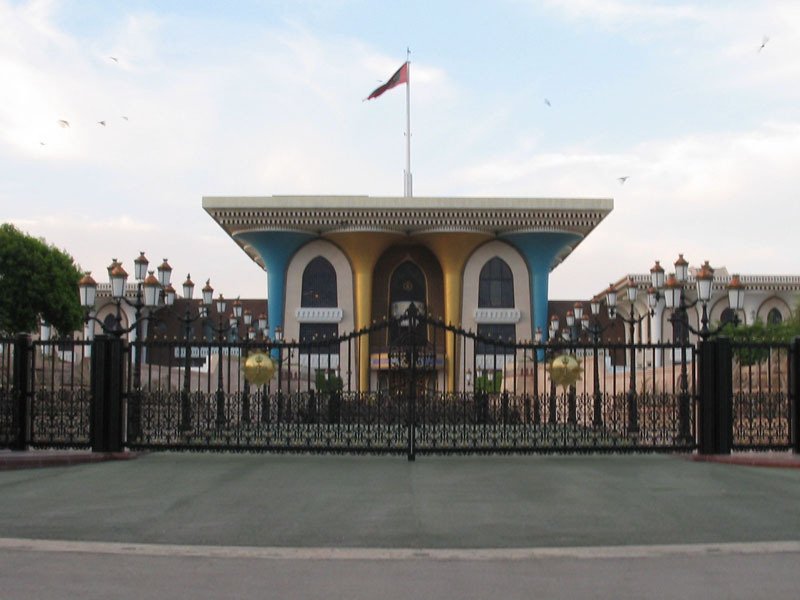 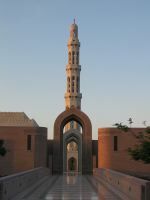 Entrance to the Sultan's Palace. 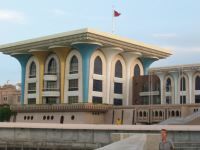 Back of the Sultan's Palace. 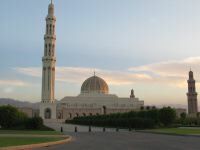 Unfortunately it's closed to the public. 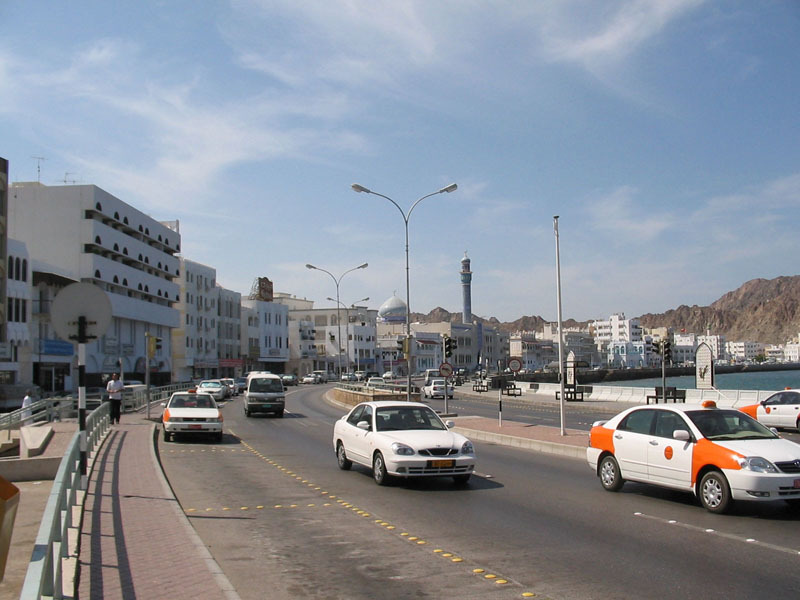 Cars zip along the Corniche, the main thoroughfare in Muscat's Muttrah district. 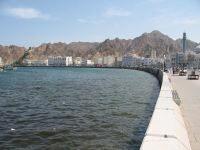 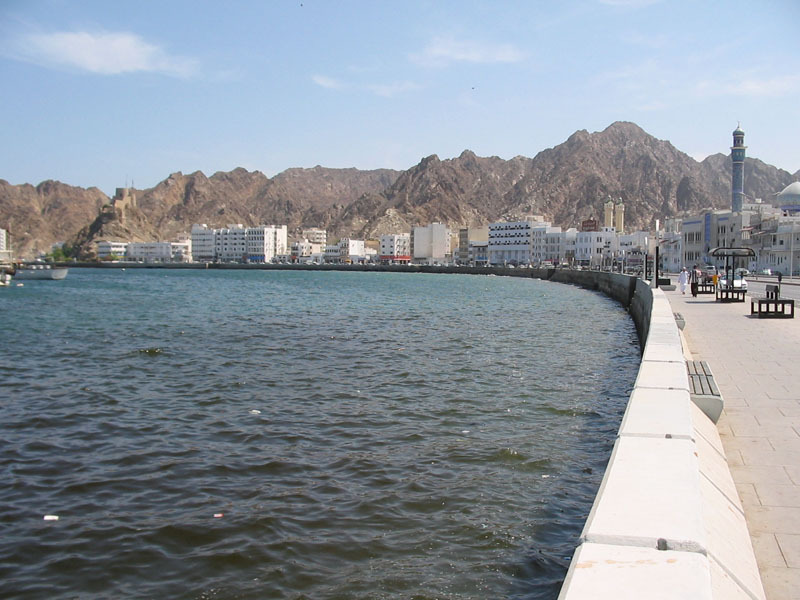 View of Muttrah harbor along the Corniche. 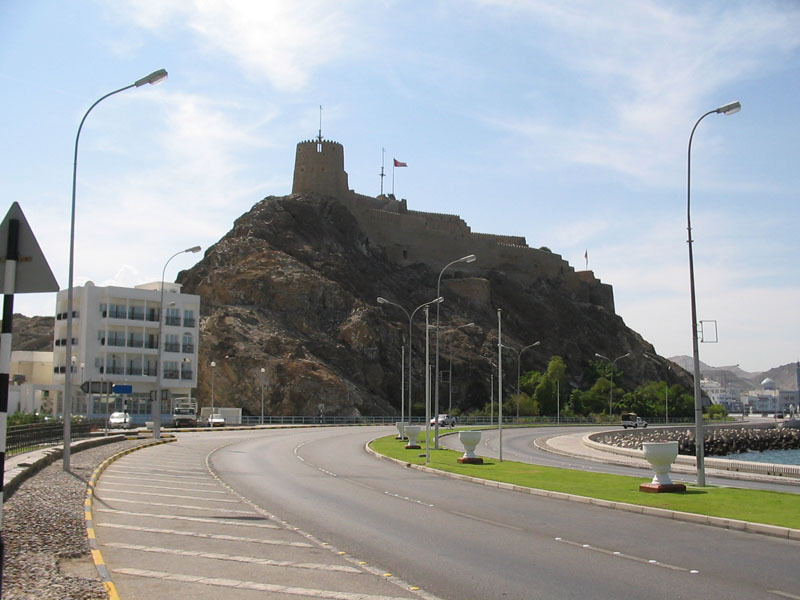 Muttrah Fort, heading eastward into Muttrah. 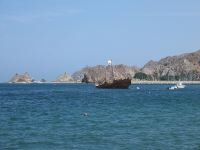 One of the many boats docked in Muttrah Harbor. 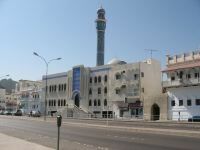 View of a mosque along the Corniche. 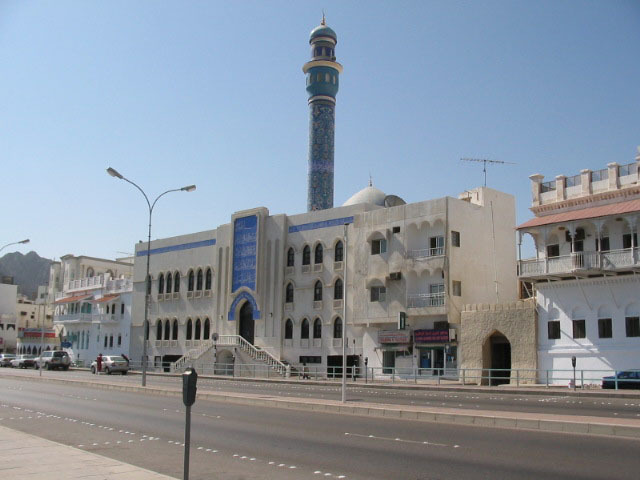 Front view of the Muttrah Mosque. 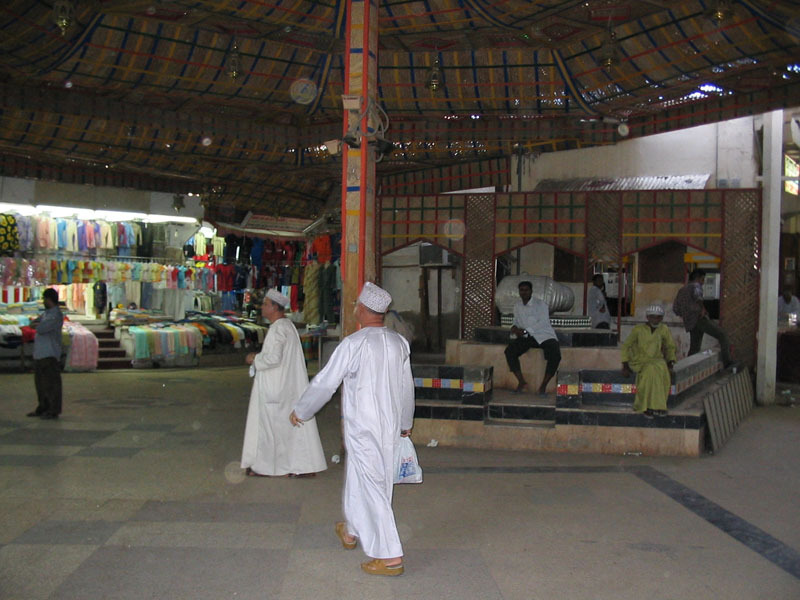 Men gather throughout the day at a small teahouse at the entrance of the souk. 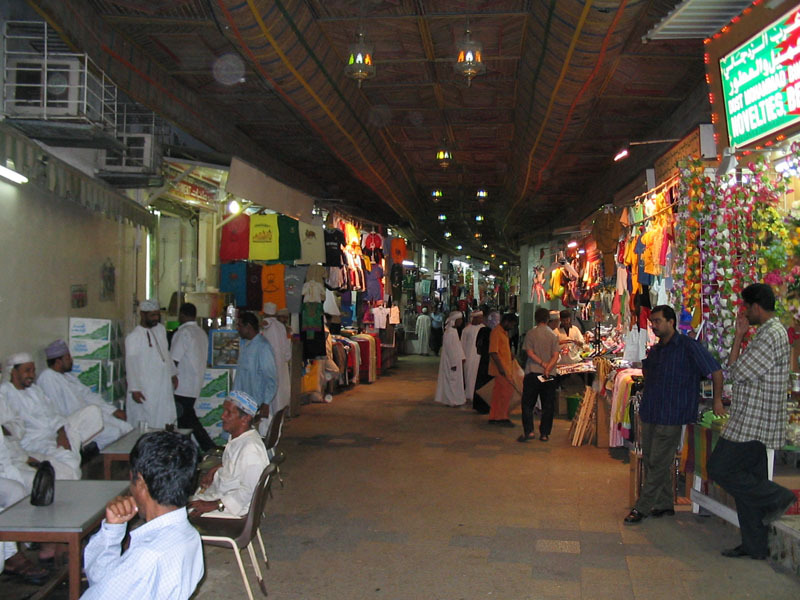 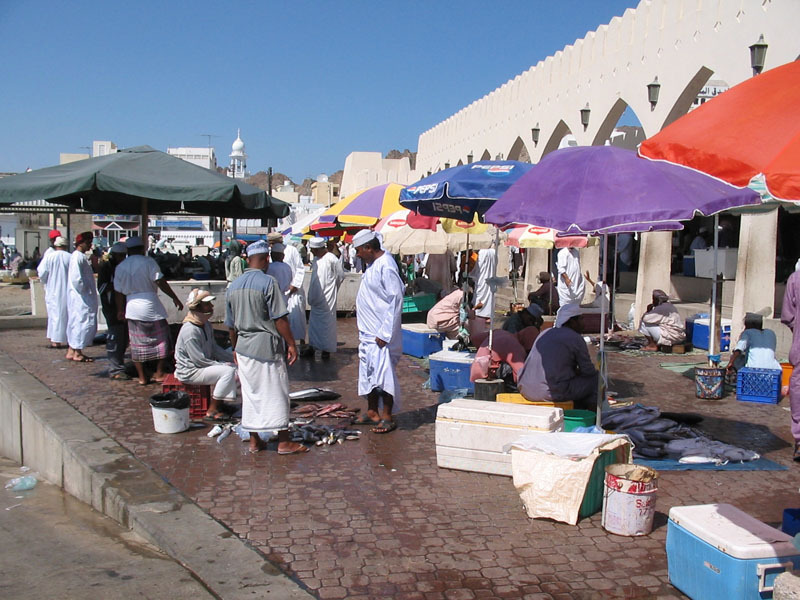 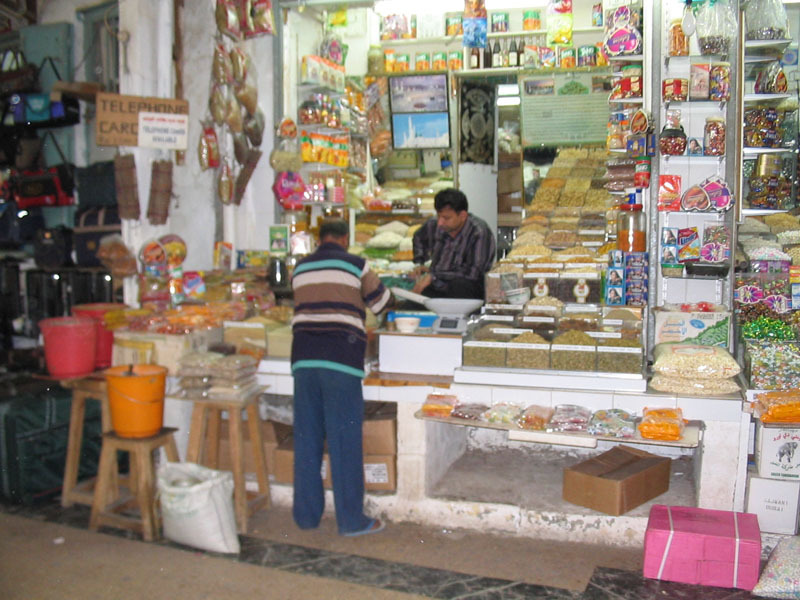 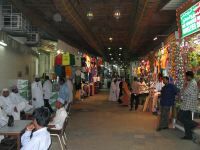 Shoppers wandering around Muttrah Souk. 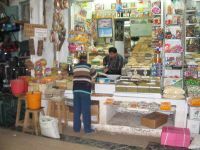 Spice shop inside the souk. 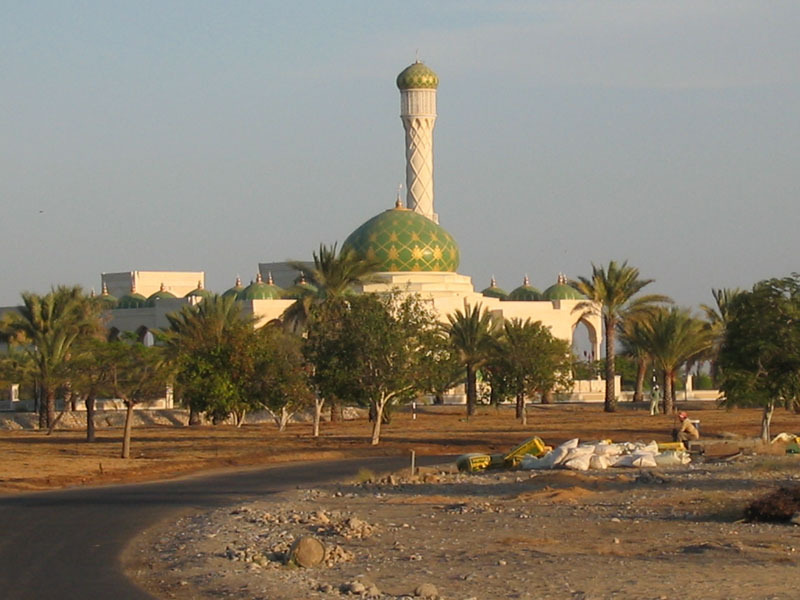 Al Qubrah Mosque, a massive house of worship just east of the city. Entrance to the Al Qubrah Mosque. 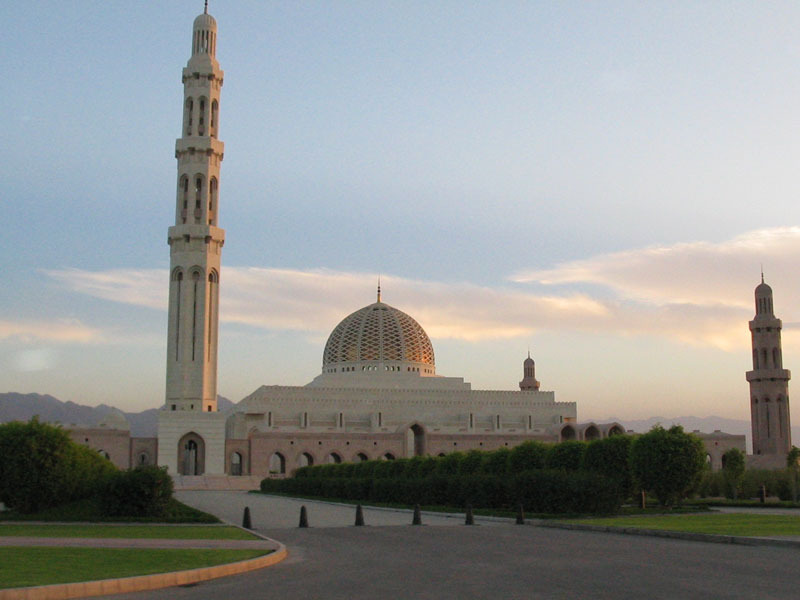 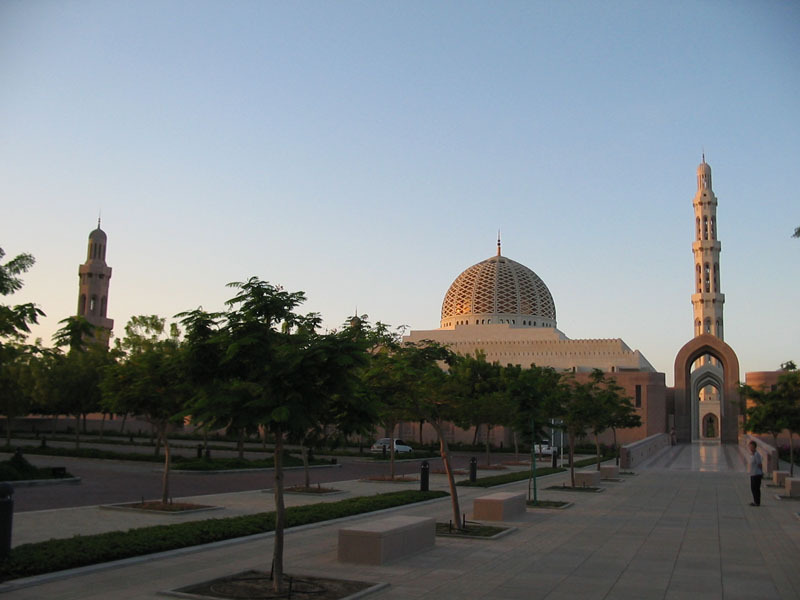 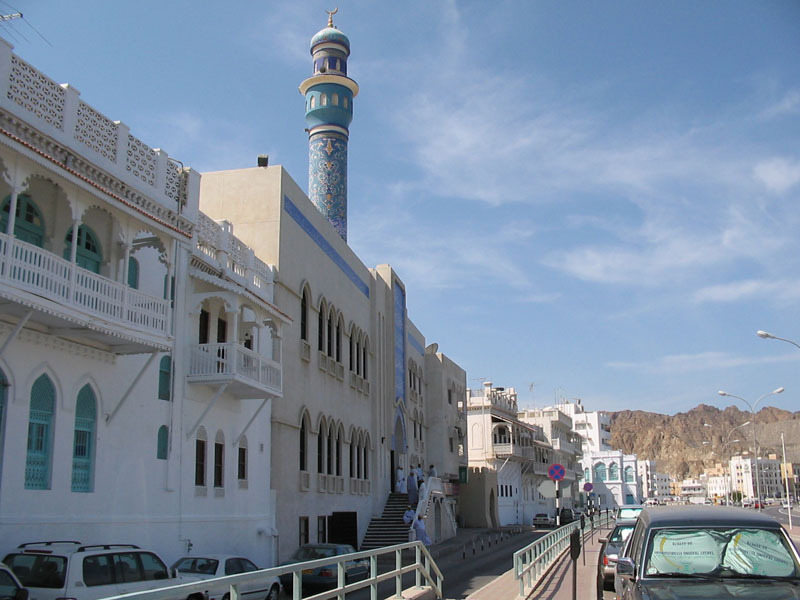 The Al Qubrah Mosque is the only mosque in Oman that allows tourists inside the complex. The Sultan's private mosque, east of the airport. 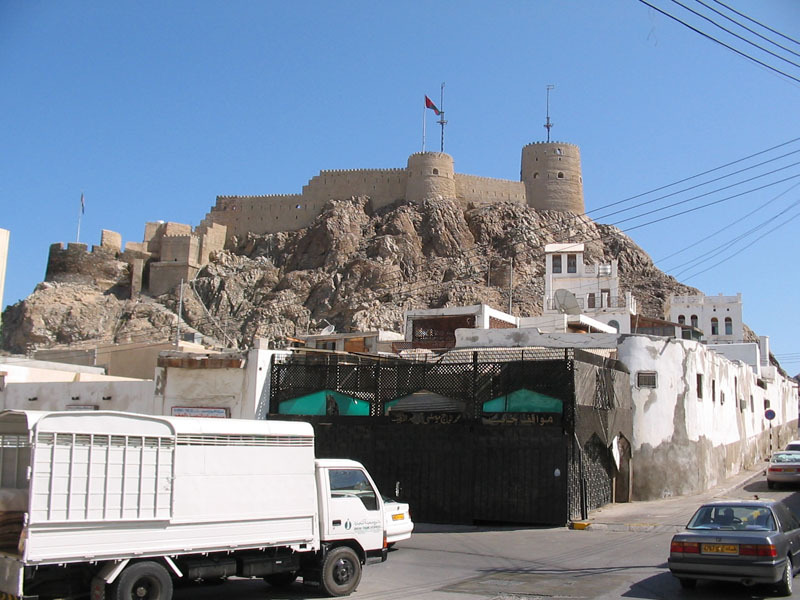 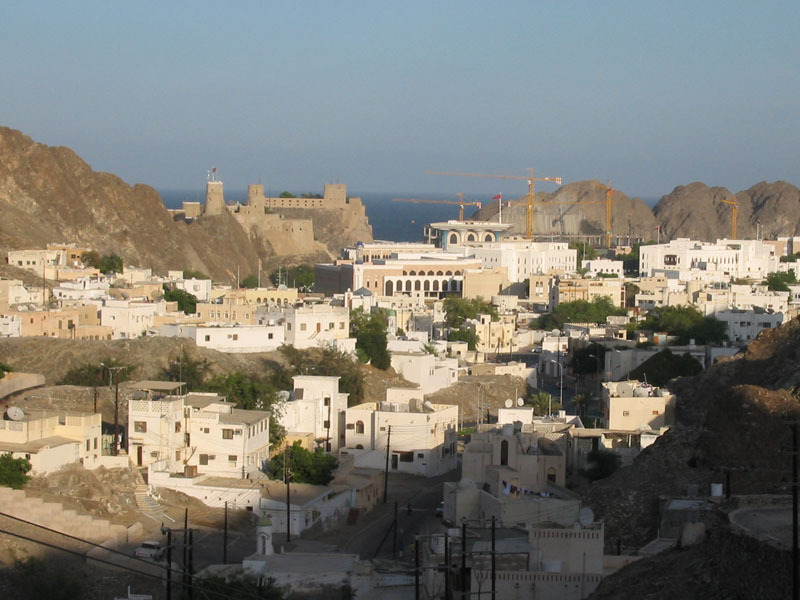 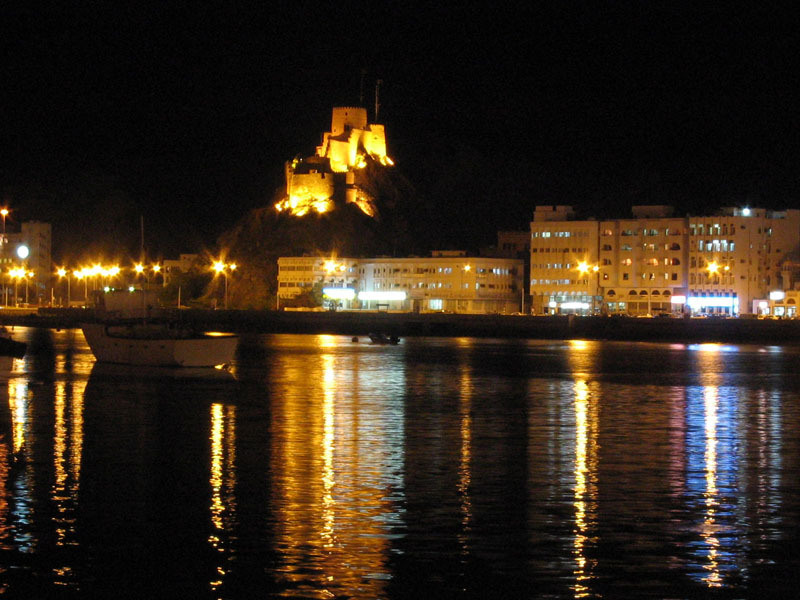 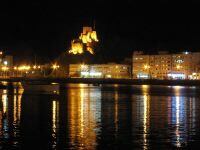 Muttrah Fort stands guard over the district. 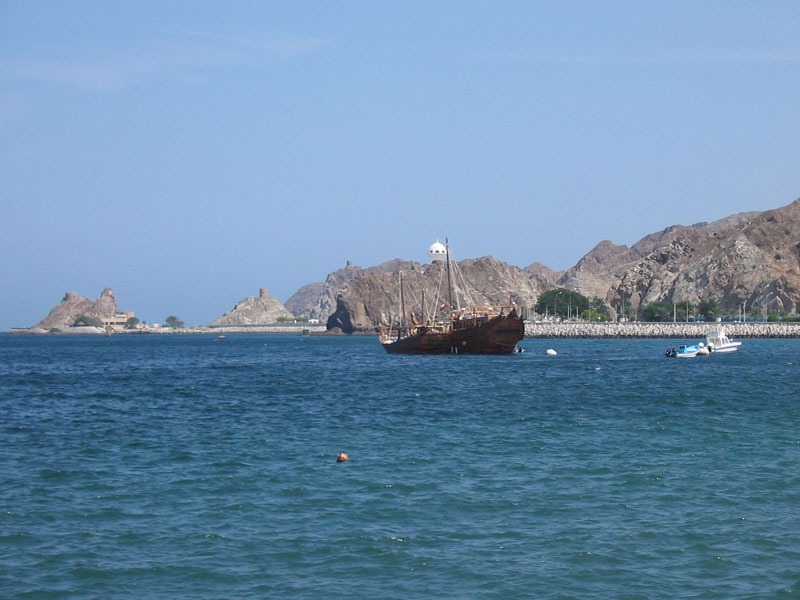 Fisherman docked along Muttrah Harbor. Some of the many fish available at the market. 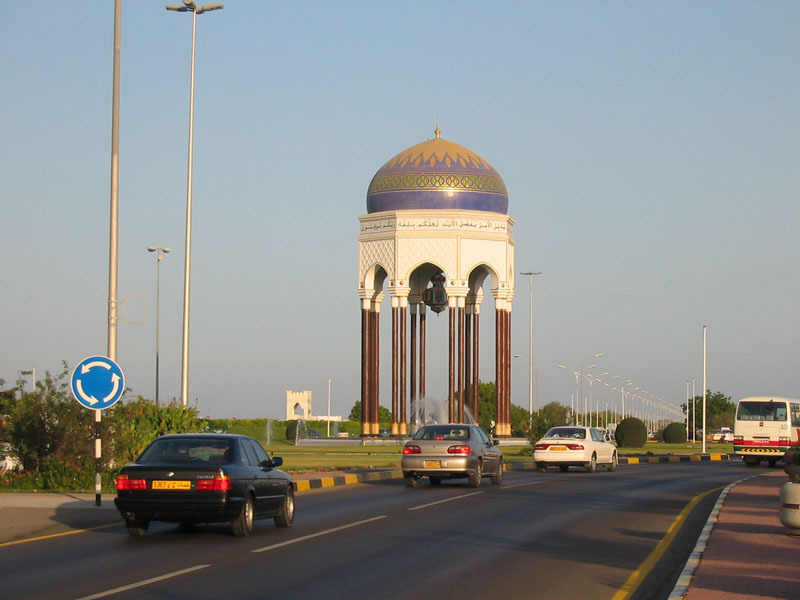 On the outskirts of the city, the main highway is dotted with roundabouts featuring marvelous clocktowers. 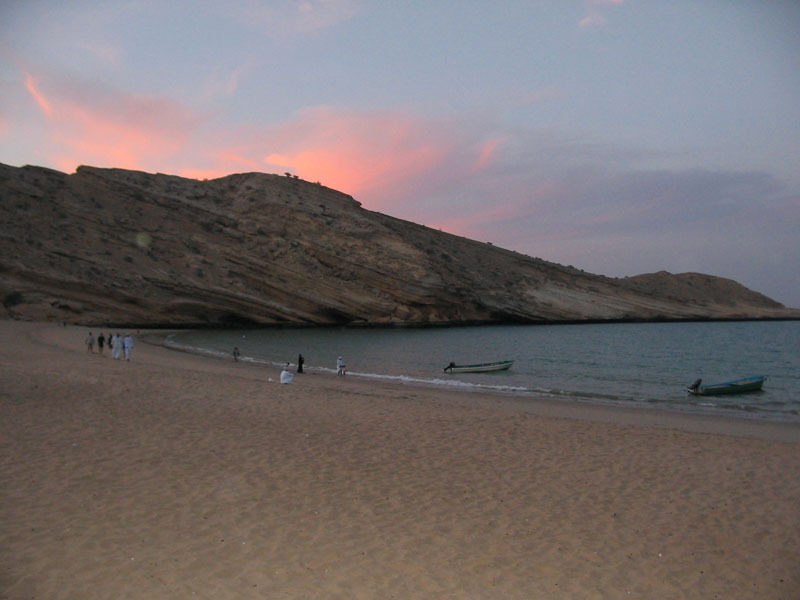 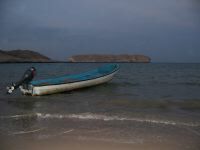 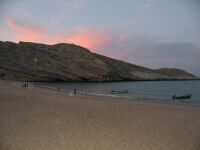 A peaceful beach at sunset, just east of Muscat. 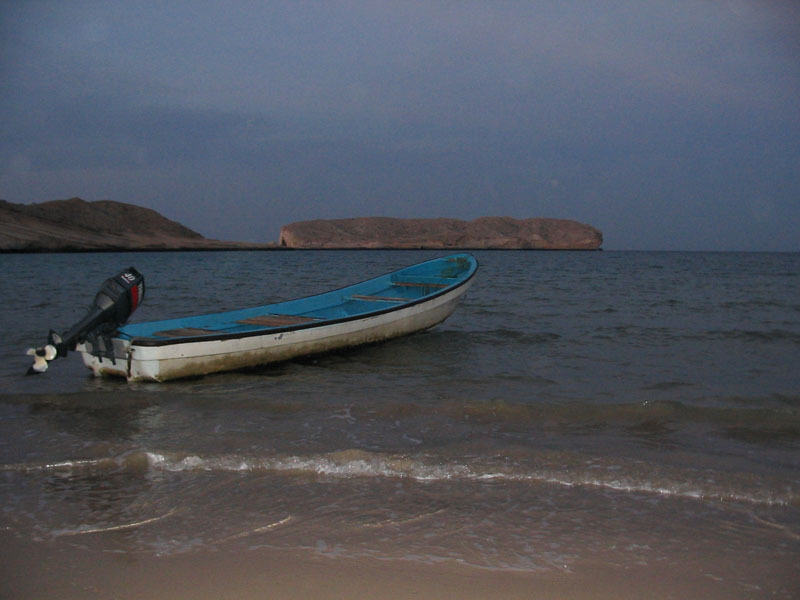 An empty boat waits for tourists. 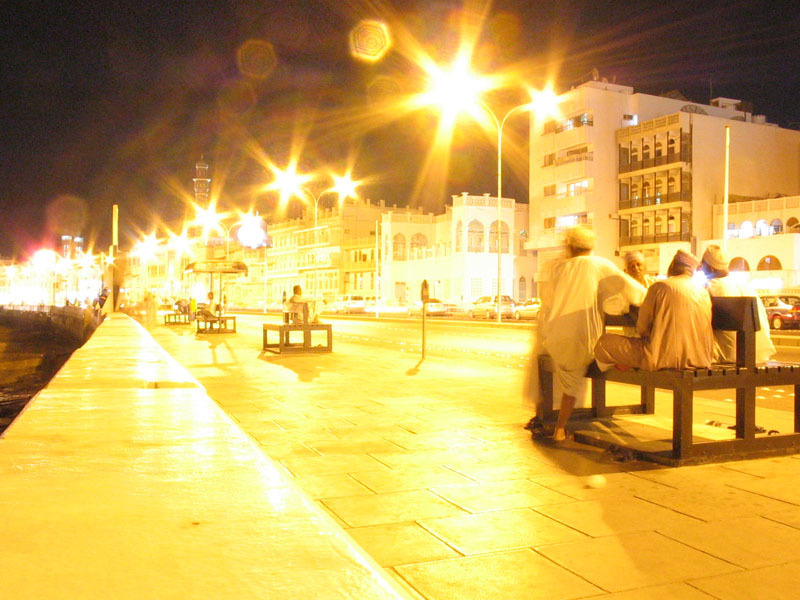 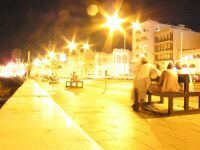 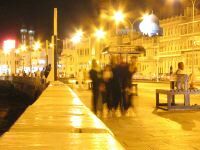 A group of Omani women go for a stroll along the Corniche at night. 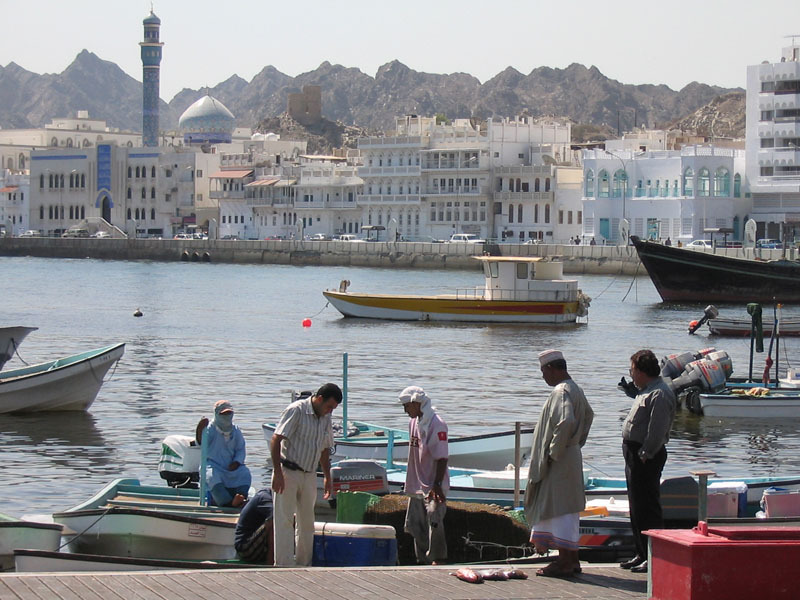 Omani men relaxing along the Corniche.